Data Acquisition Processor boards each have an onboard processor, making every DAP an intelligent solution for data acquisition and control applications. Run DAPL, a multitasking, real-time operating system. Support external expansion boards to increase the number of data channels. All current Data Acquisition Processor boards, except the xDAP series, DAP 5400a, and DAP 5380a, have onboard analog and digital inputs and outputs. The xDAP series has high-speed analog inputs and digital inputs and outputs. DAP 5400a and DAP 5380a have high-speed analog inputs. Onboard processors distribute intelligence to the Data Acquisition Processor. This frees data acquisition from the control of operating systems, such as Windows, which may not be available to the acquisition application when critically needed. By placing a processor onboard, data acquisition and control is implemented by its own operating system, DAPL, which is optimized for data acquisition. In any application the onboard intelligence has a set of tasks to do. To facilitate configuration and control of the DAP, software running on the PC communicates with the onboard intelligence, instructing it on how to behave in an application. 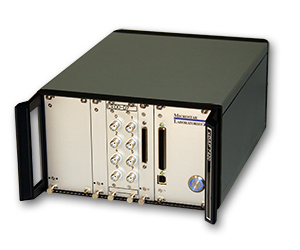 In addition to the line of Data Acquisition Processor boards, Microstar Laboratories also offers a data acquisition board with onboard anti-aliasing filters, the iDSC 1816.